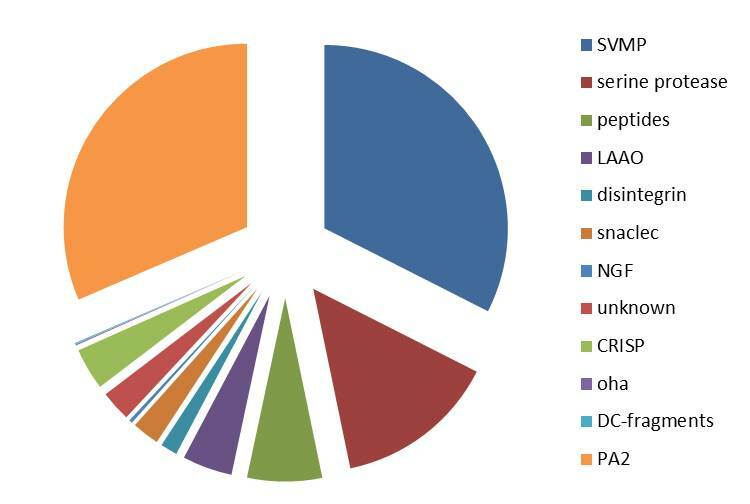 Figure 1: Composition of contortrix contortrix venom, studied at proteomic level (Lomonte, et al., 2014 ). This venom contains the following families: SVMP (venom metalloproteinase ), serine protease (peptidase S1 ), peptides (include tripeptide SVMP inhibitors and bradykinin-potentiating and bradykinin-inhibitory peptides), LAAO (L-amino-acid oxidase (flavin monoamine oxidase) ), disintegrin, snaclec (also known as C-type lectin-like), NGF (-beta) , CRISP, oha (ohanin/vespryn ), DC-fragments (disintegrin/cysteine-rich fragment from P-III SVMPs) and PA2 (phospholipase A2 ). 10.17 mg/kg by intravenous injection (Arce et al., 2003 ).